The charting and reporting software. The database automatically aggregates data collected from one or more designated sites. Data is easily retrieved to generate the required charts and reports. For user flexibility and extensibility, charts and reports are generated in Microsoft Excel. The Excel worksheet data file can then be exported in various formats and shared among users. Zooming and panning is available on the macro generated Excel charts. A key advantage of using an SQL database and Excel is that it is an “open” system, you are not locked into any suppliers’ proprietary software. You can retrieve any data available from the database and/or use the Excel data to generate additional charts and reports. The PowerScape software ships with Microsoft Data Engine (MSDE) database. The MSDE database has a 2GB limit per database. Optionally, the system can be upgraded to use Microsoft SQL Server eliminating the 2GB size limitation. Enetics PowerScape software is also used to program and manage PowerNode recorders, and to view real-time recorder readings and communications status information. It is even possible to view real-time readings or aggregated power data from a user defined group of PowerNode recorders. 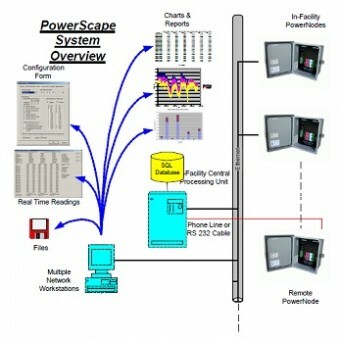 The LMS5760 PowerScape software is designed for single user functionality. The LMS-5770 PowerScape Enterprise Software (network version) permits multiple users shared access to a single database. Records Three Phase Power Consumption And Power Quality. Has Programmable Contact Outputs (Local Annunciation/Load Control). Provides Real Time Data Over Your LAN. Initiates Notification/Data Transfer On Disturbance Event. Non-Proprietary System. Single LAN Host Collects Data. Aggregate Data For Site-Independent Defined Recorder “Groups”. Web-Browser-Based Data Access Without Special Application Software. Analysis Engine Built on Microsoft Excel™.